At the HUSUM Wind trade fair in 2017, Bachmann electronic wanted to celebrate the automation of the 100,000th wind turbine. And the industry should get to hear about it. That is why in August 2017 the Austrian automation experts hired us to publicise their innovative solutions and many years of experience to new and existing customers, opinion shapers and trade journalists via social media. We recommended that the client primarily focused on Twitter and LinkedIn, because that is where we find precisely those target groups that Bachmann wants to reach. To develop the number of followers and targeted addressing of the target groups we developed a social media concept, drew up an editorial plan, placed statements and ran networking activities. 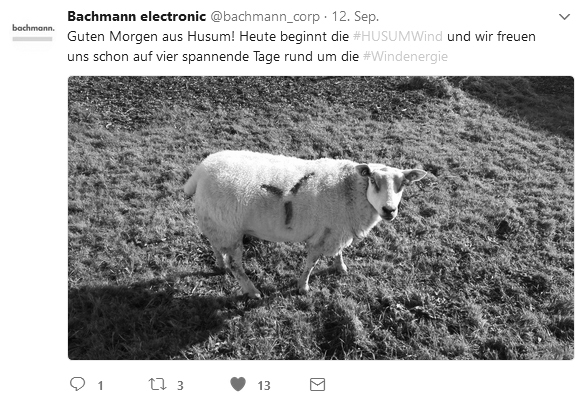 Whether it was about IT security, condition marketing or the stand party – we communicated all the most important news via the company’s existing LinkedIn account and new Twitter account both before and during HUSUM Wind. We also selected the most successful tweets for use in a follower advertising campaign on Twitter. Our social media activities attracted considerable attention: “Both PR agencies and competitors have spoken to us about many of the tweets and reports”, said head of marketing Catherine Diethelm following the campaign. Customers, cooperation partners and media responded with likes and retweets, disseminating the messages still further. Within just four weeks we managed to make the new Twitter channel @bachmann_corp known across the industry. We gained 233 new followers on Twitter and 55 on LinkedIn; by the end of the campaign we were able to register 228,000 tweet impressions and 5,700 profile visits on Twitter as well as 56,500 LinkedIn impressions. “The aim of the campaign was certainly achieved. We thank Krampitz Communications for their competent advice and campaign management”, added Catherine Diethelm, who booked us again a month later for a second project: a social media campaign for SPS IPC Drives, which took place in Nuremberg in November 2017.